Welcome to the garden of Frau Spatzer, the greatest fruit grower in history. Click here to play! Only a handful of souls have had the privilege of visiting, and all of them have left telling tales of the most succulent fruit they'd ever tasted. Incidentally, all of them also went mad with the knowledge they would never taste those fruits again. Still, you've heard how good Spatzer's fruit is, and you just have to tastes it for yourself. The apples here are the reddest, juiciest apples ever grown. The plums are the richest shade of purple. The oranges are so filled with juice that you can literally stick a straw in them and start drinking. The watermelons and pineapples have to be seen, smelled and tasted to truly appreciate how perfect they are. Frau Spatzer clearly knows how to grow fruit, though she apparently does not care for the taste herself. What a waste. Still, it's a good thing you organized with some fellow fruit aficionados to take a massive hamper of fruit home with you, to sell to the highest bidder. A Fruit Fiesta that should fetch a pretty penny - as long as you can resist eating it yourself! 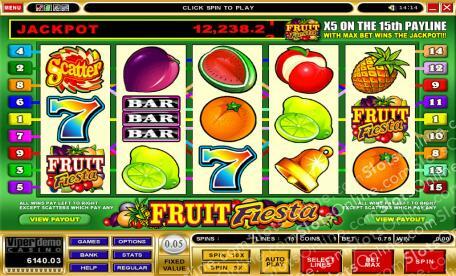 Play the Fruit Fiesta slots today, to play the game with the most succulent symbols and a tantalizing progressive jackpot. The scatter symbol pays out on the total bet when 3 or more land on the reels. 3 symbols payout 4 times the bet, 4 symbols payout 40 times the bet, and 5 symbols payout 400 times the bet. The Fruit Fiesta Logo symbol is wild, and substitutes for any symbol other than scatter symbols. It also offers the top prize and pays the progressive jackpot when 5 wild symbols line up on the 15th payline.